Something entirely frivolous for the end of the year in a vague attempt to look back over things that are less ‘my research’ centric. Everyone else seems to do their awards before Christmas which is far too far from the end of the year so hopefully this is a bit more timely that the average ‘end of list’…. Having already covered the BSPG in a fair bit of depth, it seemed about time I got round to the IVPP (the Insitutute for Vertebrate Palaeontology & Palaeoanthropology if you didn’t know) since I’ve been here over two years now. As a research institute for vertebrates (and especially dinosaurs) it’s got to be one of the most famous going, but being in Beijing and one of only four museums in the city with dinosaurs on display, it’s no great surprise that it doesn’t get too many visitors. While I have posted a great many pictures on here at various times from the IVPP these have all been of individual specimens rather than the galleries or exhibits which is the intention here. Like the BSPG in fact the exhibition arm of the institute is slightly separate and actually goes under the name of the Palaeozoological Museum of China. 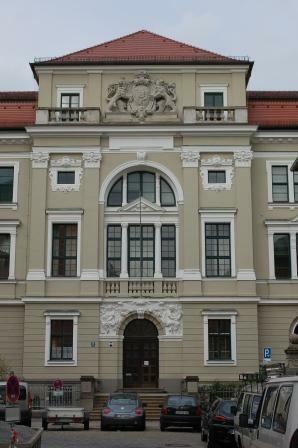 I have noticed that reviews of museums seem to go down well and since I have spent the last 3 years or so in two famous, but rarely visited institutes, it seemed sensible for me to write a bit about Munich and Beijing. The latter will follow tomorrow but we’ll start with the BSPG. 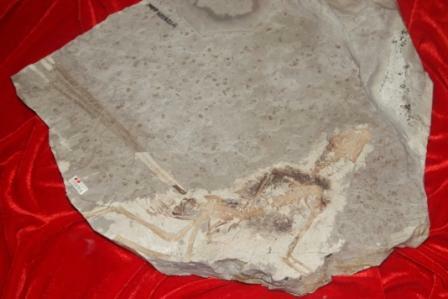 The little troodontid Mei long was justifiably feted as not only a superb specimen of a very young dinosaur but also for apparently preserving behaviour. For those who don’t know, the name means ‘sleeping dragon’ and the animal does appear to be in a very avian-like resting posture with folded up arms, the head to one side and the tail wrapped around the body. This therefore does provide yet more evidence (if a little circumstantial) for the dinosaur-bird hypothesis. 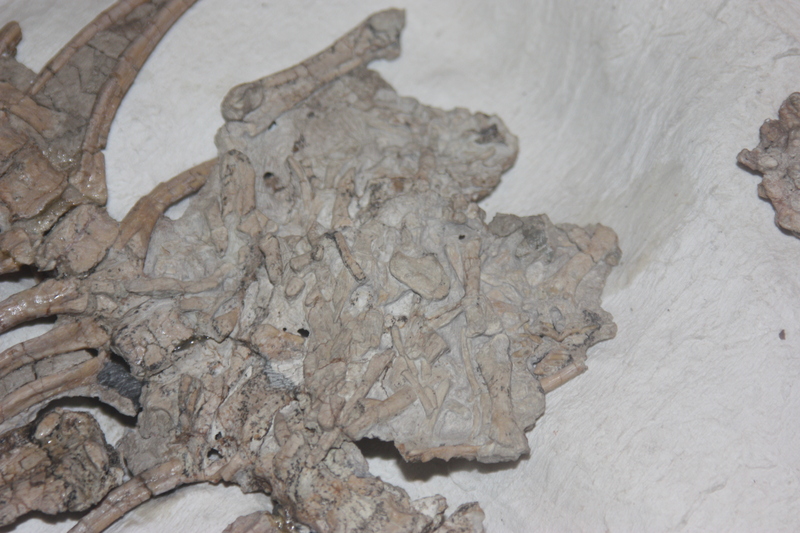 However, often overlooked is this specimen – the holotype of Sinornithoides described way back in 1993. 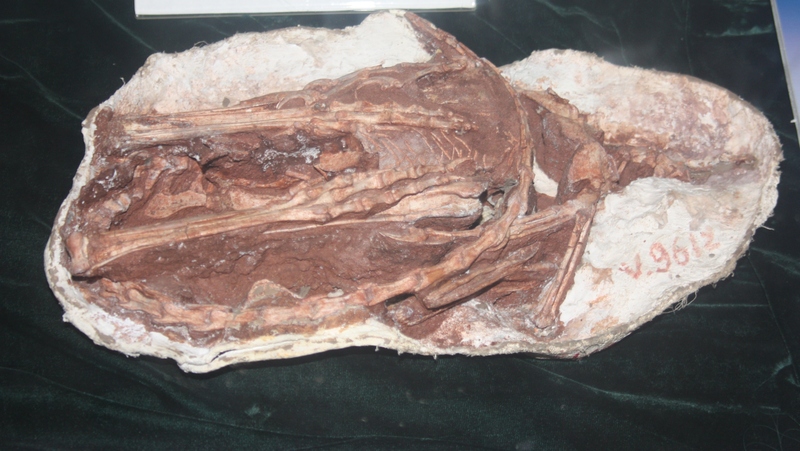 Another troodontid this one is also preserved in a posture that is near identical to that of Mei. The preservation here is also good though some more preparation would really help. While it may not be too clear from the photo, the animal is seen upsidedown, so you are looking down on the feet and legs and belly and the head is hidden underneath (though is present), the tail is wrapped around the body. Overall it is remarkably similar to the posture seen in Mei, which gives us confidence that neither was a matter of chance preservation and of course that this posture was common in troodontids and, given it’s similarity to that of birds, probably was normal for other maniraptorans too. This is of course also similar to the posture taken by various oviraptorosaurs that have been found on their nests so it would be no great surprise if we found ornithomimids and therizinosaurs like this one day too. 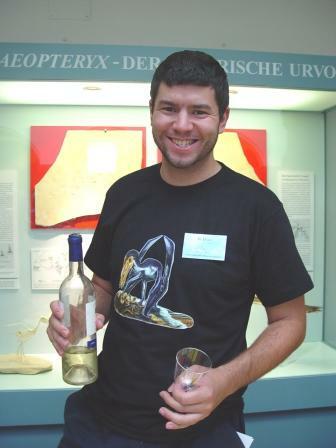 While I only briefly covered Matt Wedel’s recent brush with the TV documentaries, I do have a store of things I’d like to discuss at some point about them with my “science communication” hat on. I often lay into the print and online media on here and less so for the TV crews if only because being in China (and before that Germany) I don’t get much of an opportunity to see them. 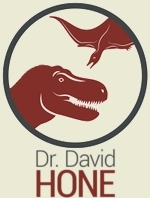 Secondly, I find it hard for them to capture my attention – I can read through a few hundred words on dinosaurs in a couple of minutes and get a good impression of the piece and often it’s about something new so there is new information there. With a TV show, it can be an hour long and tell me nothing I didn’t know 10 years ago, so regardless of its quality, I’m likely to get bored. However, I do pick up enough clips online, and I do see shows when I’m in the UK (and get the odd DVD), and I do speak to both colleagues helping out on the shows and with the people making them. I’ve done various background bits for a couple of series and am friends with a documentary maker in the UK, so I suspect I have the bases covered as well, if not better, than most. Even so, it can be hard to form a proper critique of this kind of thing as it’s fundamentally hard for me not to view something with my researcher hat on. I’ll spot most of the even incredibly minor inconsistencies and the major ones will annoy me, even if 99% of the audience misses it. Bearing all that in mind, here’s my little manifesto. 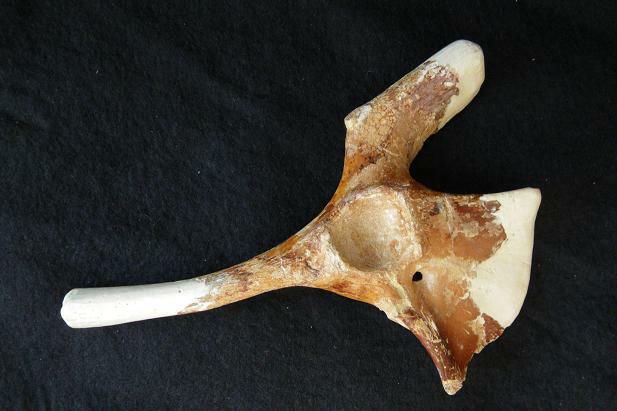 While hurridly ploughing through various things over the last week (including submitting my Palaeo Paper Challenge paper) I stuck up a very lame post which consisted entirely of a photo of a pterosaur sacrum and a label to say it was a pterosaur sacrum. Now I have a little more time, I’ll revisit this topic in at least a bit more detail. I mentioned Repenomamus on here in the middle of last year with photos of a couple of specimens on display at the IVPP. However here is a close-up of the second of those two which (hopefully) shows up at least some of the bones inside the chest cavity identified as belonging to a psittacosaur. Stomach contents like this are generally rare in the fossil record and lets face it, finding the bones of a dinosaur in the gut of a mammal in the Cretaceous is quite something. Well only one actually. Still, I could hardly leave out this new image of Epidexipteryx after it made it’s bow in the pages of The Onion now could I? Well I had promised some more thorough and longer posts rather than just this near endless series of pictures, but that promise may have to be delayed a little longer. Fortunately the IVPP has switched some things around in the galleries and combined with my getting a new camera, I’m able to get some much better pictures of various specimens and so can stick them up here. 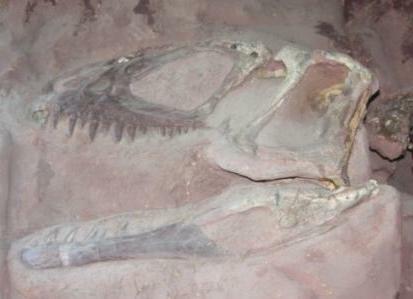 Following on from Limusaurus, it’s a cast of the little studied Dilophosaurus sinensis (well, the skull anyway). This animal has been a source of contention as despite the obvious presence of a pair of crests along the snout, there are a number of differences between this animal and the skull of Dilophosaurus wetherilli and thus likely belongs in its own genus but no one seems to have got around to restudying the original properly and in fact I’m not actually sure where the original is housed since I don’t have a copy of the original description. This is hardly unusual though – a great many fossil specimens languish in collections which people agree need revision, but no one has the time, money or incentive to get around to doing the work (or of course it sits at the bottom of a ‘to do’ pile, or is held up by other factors). So while we continue to refer to this as Dilophosaurus, I can’t think of any theropod worker who has things this genuinely belongs in this genus. Ah, the travails of taxonomy!